How easy is it to pick up where you left off with an old pal after 17 years with no contact? Very easy, when that pal is Nicola N.
We’re friends from the early days of the Women in Publishing Society in Hong Kong. Nicola is an editor/journalist. 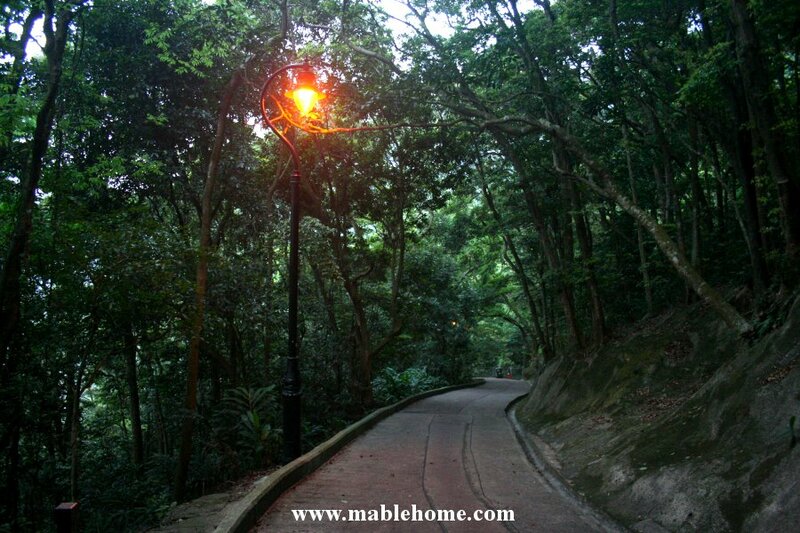 She’s now living back on Lamma Island after a three-year stint in London. She and Enid, a financial journalist, live with their two cats in a fabulous pad in the tiny village of Pak Kok Tsuen, a half-hour's walk from Yung Shue Wan, where I arrived on the ferry. 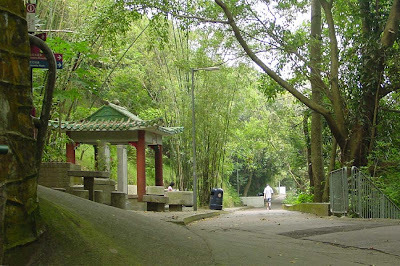 There are no cars on Lamma, which is criss-crossed by narrow paths. It’s a great getaway from Hong Kong. Today was hot and sunny, so there were lots of daytrippers about. Coming back, I took a smaller ferry from Pak Kok Tsuen to Aberdeen. Where I was sitting in the back, there were eight or so people and five dogs, who looked like they’d enjoyed their excursion to laidback Lamma. 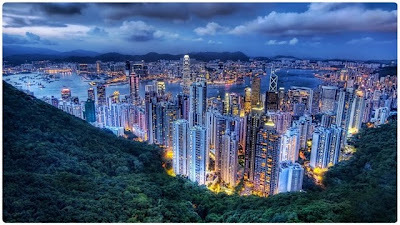 On Thursday I had my appointment at the bank to set up a business account for my newly registered Hong Kong business. I got back to the Helena May right on time for the book group lunch I’d been invited to by Cath’s friend Melinda. This is the first time I’ve finished reading the assigned book before a book group meeting. I really enjoyed it: Elizabeth Strout’s novel, “Olive Kitteridge”. Others there were Lydia, Bren and Liz, who was back visiting Hong Kong from London and is running the New York Marathon this year. We’re going to try and catch up afterwards. Yesterday, Polly and I had lunch at the FCC with Maggie and Karen from a company here whose monthly newsletter we produce. It was fun. From there I went to Causeway Bay to see an exhibition at Times Square that Polly had seen and thought I would like. 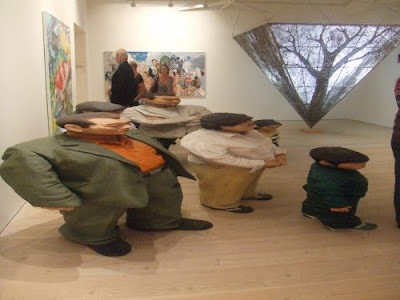 I just loved the work by the Korean sculptor Hwan Kwon Yi. Back to the FCC last night for drinks and dinner with Cath, Polly and her friend Betty. Charlie arrived from Macau with my camera charger that I’d left behind. Cath and I then went on to the Skylark Lounge to see Brendan’s band, Bank Job, play. Cath’s Rebecca joined us there. I thought the second band, Balu and The Jungle, were fantastic. Polly and I had lunch with our accountant, Millie, on Monday. We did a bit of reminiscing about the old days, and looked at my options for the future. When I spent three months in the US last year, my house was looked after by Gary and Sue C, whose daughter Megan designed my name card. I've now met another member of that family. Megan's brother Brendan works in legal publishing in Hong Kong, and we caught up for drinks and a great chat at the FCC on Monday. Yesterday I met up again with a new pal from Saturday's hike. Lucy, a financial planner, is Australian, but born in Beijing. She's been here four months and is loving it. We had a couple of drinks at the Dog House bar in Wanchai. I went from there to dinner at a nearby Peking restaurant with Polly, Jenny E and Rehana S from Women in Publishing (WIPS), and Angela S from Saturday's hike. A really fun dinner. I met Rehana at a WIPS function here some years ago. She's writing a Pakistani cookbook. I’ve rearranged my weekend so that I can do Angela’s Sunday hike on Lantau. Cathy H-F, who has been a WIPS president, took me to lunch today at the Quartermaster Deck, where I had dinner last week with Cathy, Brenda and Melinda after the book fair. Cathy is the sort of person you want on your team: she’s a changemaker. She’s also a marathon runner and marathon trail walker, dog rescuer, chairman of the SPCA in Hong Kong, and a volunteer extraordinaire. She’s also good fun. Cathy invited me to go with her to the SPCA offices this afternoon for the opening of their ‘Caring Family, Happy Pet’ program. The ‘faces’ of the campaign are a cat whose name I didn’t catch, La Fleur (a Shih-tzu x Maltese with a fabulous overbite who I spent some time with), and the ‘famous celebrity’ Susan Tse Suet-Sum and her daughter Ka-Wing. A former Chinese opera singer and actress, Susan is also, according to Wikipedia, the 76th-generation descendant of Confucius. Cathy also introduced me to Sandy and Wendy, executive director and customer services, respectively. A lot of pets are surrendered or abandoned in Hong Kong when families are expecting a baby. The traditional thinking is that it’s bad for the baby to be around dogs and cats. The aim of this campaign is to try and change this thinking. ... Back of my neck gettin' dirty and gritty. Did I mention it's mid-summer in Hong Kong? It's hot and humid, which makes it perfect movie-going weather. I've been lucky to find the perfect f*** buddy in my old friend Cath. That's "film buddy"! Yesterday we saw the mainland Chinese blockbuster "Aftershock" (directed by Feng Xiaogang), about the impact on one family of the 1976 Tangshan earthquake. The acting was a bit cheesy in some scenes, but it was gripping viewing for over two hours. We both were big sooks. Very cathartic. Last Friday I went to two sessions at the Hong Kong Book Fair. The first was a talk by Andrew Xia Fukuda (www.andrewxiafukuda.com), a Japanese-Chinese, Hong Kong-raised, New York-based criminal prosecutor. His book "The Crossing" is his debut novel and took him 10 years to write. Between that session and the evening one I met up with one of my authors, Eva Wong, whose book "The Power of Ren" I worked on about four years ago for John Wiley in Singapore. Eva is pretty amazing. Last autumn, she emerged from a detention centre in Beijing where she had spent two years on charges relating to mismanagement of tax payments by her China coaching company. Her husband is still in another detention centre in China, with two more years to go. Eva spent the time doing life coaching with the other inmates. She is a perfect example of someone who had made the best of a negative experience. She believes that no one can deprive you of your liberty, even if they can imprison your body. We popped up to see Mary J, Eva's friend and former colleague who took me to lunch a couple of years ago. We have a friend in common at Pearson Education in Sydney, where Mary once worked. On Saturday afternoon it was great to catch up for coffee with Sue S. I've done work for her company and an associated company since the early 1990s. We had a fun chat. After that I joined up with members of a hiking group I've walked with before in Hong Kong. Last time we walked way up in the New Territories; this time, because it's mid-summer, we did an evening walk up to The Peak from Central. Because it's Hong Kong, and we could, we started the walk by taking the Mid-Levels escalator up through SOHO and the area above it, around the mosque, to where we could access the old route that becomes Old Peak Road (shown above). It's very steep and a terrific workout. I'm going back there again this week to help prepare for my walking holiday in Italy, which is coming up at the end of next week. In the early days of Hong Kong, people living on The Peak (i.e. the British colonial administrators, business taipans and other moneyed folk) were ferried up and down in sedan chairs carried by "coolies". When the path back down got very slippery, Jenny E (who I know through Women in Publishing) and I peeled off and took a cab to Hong Kong Park, where the others arrived soon after for a Thai dinner. I had met Angela S on my previous walk with this group. She's a life coach and knows Eva. Lots of interesting people among the group. 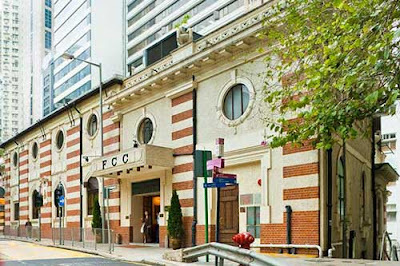 I'm now finishing up breakfast at the Foreign Correspondents' Club. Polly and I are having lunch today with our old friend Millie S, at the Hong Kong Jockey Club at Happy Valley Racecourse. Millie has been the accountant for Women in Publishing since we became a society in the early 1990s. We're looking into the tax implications of my no longer being a resident of Australia. Plus it's always good to see Millie! Earlier this morning I ran up on Bowen Road. For a while I tucked in just behind the left shoulder of a Filipino woman who was probably a bit younger than I am and running at a good pace for me. The only sound was our well-matched footsteps. When we reached the Stubbs Road end of the path, I thanked her for letting me hang off her back and we spoke for a little while. She said that running, for her, is "free medicine" and "God's grace". What could I say, but "Amen!" 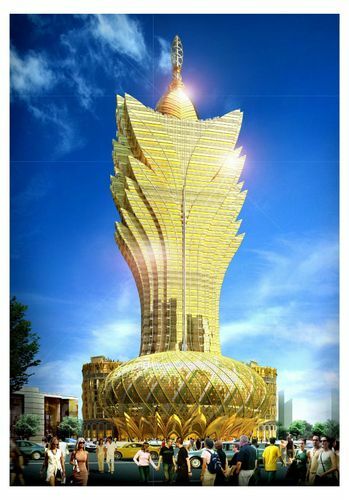 I love an audacious building, but some of the new hotel/casinos in Macau just look silly. When I first started visiting this former Portuguese colony in the 1980s, the very modest Lisboa Hotel and casino on the Macau waterfront was the city's only high-rise building. Today, Macau (on the Chinese mainland) and the island of Taipa have been changed almost beyond recognition. This building, the Grand Lisboa, now towers over its aged relative. Reclamation along the waterfront and on Taipa has created space for dozens of spectacular, and some spectacularly kitsch, casinos. It's best seen at night, when the lights help distract from the tackiness of the place. I'm not saying the buildings aren't "grand" and spectacularly fitted out, but they are casinos and they are there to attract mainland Chinese gamblers. Sleepy, laid-back, Portuguese Macau has been sold down the Pearl River for the sake of a lot of patacas. I spent two days there this week with my long-time friend Polly and her partner, Charlie. I had a dicky tummy and didn't have much of an appetite, but I enjoyed doing my bit for the economy of Macau by playing the pokies at The Venetian and City of Dreams casinos (cashing in each time before I inevitably lost the lot), checking out the Macau Museum of History, wandering through the old shopping lanes near the ruins of San Paulo, and eating dinner at Fernando's on Coloane Island. The three of us also went for an early-morning walk up to the top of the hill near Charlie's apartment on Taipa, which provided great views of the casinos and across what's left of the river to Macau. Oh, and I also saw a lot of loos during my visit. Film note: I saw "Fish Tank" last Sunday with Cath and her daughter, Rebecca. Highly recommended for a grisly look at family dynamics in a run-down housing estate in England. I spent last weekend mostly working, apart from having yum cha with Cath and David N on Sunday. I caught up with Cath when I was in Hong Kong early last year, and we’ve stayed in touch since then. We were all young twenty-somethings together in college at the University of New South Wales at the start of the 1970s, and now we are at the other end of our careers. Monday morning I got “back on the horse” after my disastrous run two weeks ago, when I got heat stroke in Kuching in a 7K race. I walked up the hill to Bowen Road (shown here), where I used to run the 8K course frequently in the 1980s. I ran only a couple of kilometres, but it was enough to put some distance between me and my fears. Had dinner at David N’s on Monday. Others there were a British dentist who has written three books on the history of the Macau Grand Prix, and his partner, a diamond valuer. David has offered me use of his villa in Croatia. Two problems: I’ll need a car, and I no longer drive; and it doesn’t have internet, so I wouldn’t be able to base myself there for anything more than a quick visit. I want to find a way around these problems, as it looks gorgeous and it’s a very generous offer. On today’s early morning repeat visit to Bowen Road I got talking with the editor of an Asian finance magazine. Lara and I, and her young pup Gypsy, ran together for about 2.5K. I’ve been working quite a bit from the Foreign Correspondents’ Club’s Main Bar, where there is reliable internet access. As I was leaving today to meet Carol for lunch, I saw Marty M, who I now know through my Melbourne pal Jenny. He had also been for a run this past week. Carol and I had originally planned to go to China Tee Club, where in about 1988 get-togethers of what became the HK Women in Publishing Society used to be held. (Carol has been hugely important in getting “Imprint”, a publication showcasing the writing of WIPS members, into print each year.) China Tee was closed for a private function, so we went instead to Post 1997 in Lan Kwai Fong. In 1985, when this was still “1997”, I went there for dinner on my own during a business trip to Hong Kong. 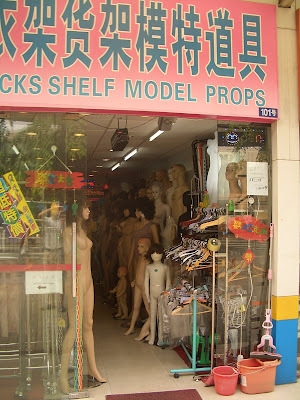 I decided that night I would try and return to Hong Kong to live. That decision changed my life. I missed out on going to Cath’s book group tonight. The assigned book was Hilary Spurling’s “Burying the Bones: Pearl Buck in China”. I’m about halfway through it and I’ll take it with me to read on the train to Guangzhou (formerly Canton) tomorrow morning. I had to finish a job tonight, and technology was uncooperative so I was running late. I really wanted to go! Instead, after I finished work, I had dinner in the main lounge here at The Helena May. (I’m staying in the annex, but I also use the main building for better internet access.) The place is so different from when I lived here. To its credit, it has totally reinvented itself as a very different restaurant venue in Central. I haven’t had time for sightseeing this past week, but I managed to get to the Chilean artist Margarita Dittman’s exhibition on Hollywood Road. Fabulous. She’s only about 30 years old, but makes very complex, satisfying photographs. It’s easy to hit the ground running when I already have friends in a place. Cath and I went to the movies at midday the other day to see ‘Chloe’. I enjoyed the film, but I also really enjoyed the picnic lunch of corned beef and salad sandwiches that Cath brought along, complete with salt and pepper, other condiments, and napkins! The theatre has only about seven rows, so it’s obviously used only for art house films. Yesterday I went up to Clearwater Bay, in the New Territories, early in the morning to do a walk with a publishing contact, Carol, and her two rescued labradors, Guinness and Penny. The views over the bays and across to various islands were stunning. We ended up at the Tin Hau temple, where there has been a temple of one kind or another since the 13th century, I think Carol said. The last time I was there was in about 1990, with one of my authors and her husband on their private junk. The other guests included an ABC TV film crew from Australia, who were making a documentary about the forthcoming handover of Hong Kong back to China in 1997. Last night was spent at the Foreign Correspondents’ Club (FCC). I had a fabulous time meeting some more of Polly’s friends. Chris is in communications. He has written and published books on buying property in Hong Kong and Japan. He’s good fun and has encouraged me to visit Japan, as did Marty the other night. Ian is an old b/f of Polly’s. He’s with the police. I met him years ago very briefly. A really nice guy. His girlfriend Mary is with a bank and moved here from New York only last year. We had a great talk for hours. Polly’s boyfriend Charlie is a sweetheart. He works in Macau in security with The Sands casino. Polly and Charlie came by the Helena May this afternoon for a drink. Among other things we talked about my tax status in Australia if I’m no longer going to be a resident there. I spent four hours today working at the FCC and eavesdropping on the tantalising conversations around me. One guy was flying off to Manila in a few hours to judge an art competition, while another had just had a book published. I chugged away at editing a book on leadership in China and tried not to drop cellophane noodles from my Thai seafood salad on my keyboard. 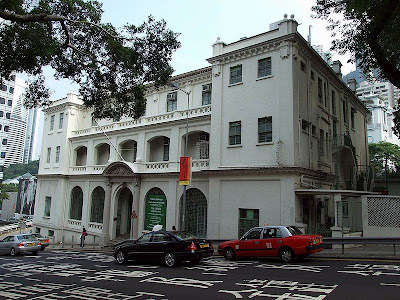 From April 1986 until mid-1988 I lived in a private club in Hong Kong, just uphill from the American Consulate and the lower Peak Tram station. The Helena May is a white, colonial-era building; during my time as a resident it had slowly turning ceiling fans and wicker furniture. It had been built in 1916 to accommodate young British women who had journeyed out to the colony in the hope of finding a husband among the ranks of the young colonial administrators or the traders in the commercial firms, or who were on their way to China to work as teachers or missionaries. During the Japanese occupation of Hong Kong after Christmas 1941, The Helena May was used to house Japanese soldiers and stable their horses. When I was living there, it housed single "gels" like me who were in possession of a foreign passport and were in Hong Kong to work. It was sort of a boarding school for mature-age students, but with privileges that didn't include taking men to one's room. During the day, the club catered to the expatriate-wives-who-lunch-and-play-bridge set. It also had the best small library in Hong Kong. I became pals with a group of Brits. Sarah worked for Swire, one of the oldest of the Hong Kong hongs (or trading houses). Swire owned Cathay Pacific, and Sarah was personal assistant to the head of Personnel. She had previously worked for a Harley Street specialist and at the Kuwaiti Embassy in London. Suzie worked in administration at one of the International Schools that provided English-style schooling for the children of expatriates. She also volunteered some of her nights as a Lifeline phone counsellor. Debbie, who had lived in Dubai before coming to Hong Kong, worked in fashion. She had a Muslim boyfriend who would turn up every now and then from the Middle East and whisk her off to somewhere exotic. She and I would sometimes go down to the squash courts near the Peak Tram station for a game of hit-and-giggle squash after breakfast. She was very glamorous and invested heavily in gold bracelets. Anne worked in finance. She was my "business manager", in that she would receive my faxes and bring them home to the HM at the end of the day. Imelda worked in the South China Morning Post Bookshop on the Star Ferry concourse, and Francesca was a journalist with the Post. We would all start the day together at "our" table. After brekkers, my pals would head off down the hill to their various offices. 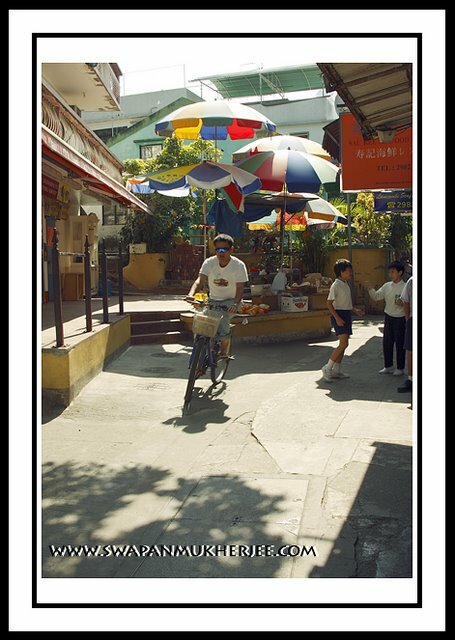 (On Hong Kong Island, everything is either uphill or downhill from where you are.) I was now a fully-fledged freelance editor and working from home. I would go back upstairs to my room and gather up whatever job it was I was working on that day, along with my pens and corrector fluid. (It was all very low-tech in those days.) I would then set myself up at my table in the lounge and work all day until my pals starting drifting in during the late afternoon. The lounge had a regular rhythm during the day. Club members would start arriving from mid-morning for a cup of tea with a friend, to exchange their library books, or perhaps to have a game of bridge. I must have been an enigma to those women: always there; always alone; my small round table covered in papers and books. My clients must have thought I had a secretary to answer my phone, when it was the staff of the club. At around midday the place would fill up for lunch. The Helena May was a blessed relief if you were spending the day shopping in town. It was cool and civilised. The lunch menu offered reassuring choices along the lines of toasted cheese sandwiches and pumpkin soup. And their cheesecake was renowned. After lunch, the lounge would empty. It wasn’t until school finished, around mid-afternoon, that the pace would pick up again. Mums and kids would have arranged to meet at the HM, so there would be another flurry of activity, with trays going to and from the kitchen and kids going to and from the library. 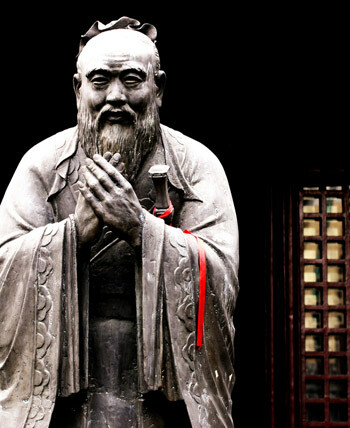 It would all quieten down again after about an hour, and I would start to wind up my work on whatever new book I was editing on the trials and tribulations of doing business with China. By about 5.30, Sarah, Deb, Suzie, Imelda, Francesca or Ann would have drifted in and we would settle in the padded armchairs and have a natter about our day. "Don’t mind if I do." If any of us were known to have gone out the previous night and hadn't shown at breakfast, we were deemed to be "dirty stop-outs". On nights when we went out, we would be let back in (if we weren’t being dirty stop-outs) by the night watchman. We would press a buzzer on the wall beside the side gate at whatever ungodly hour it was to raise John, who would be sleeping on a camp-bed in the kitchen. "Thanks, John! May I have one of your cigarettes, please? I promise I’ll pay you back tomorrow." "You been to nightclub AGAIN?" he would ask, handing over a fag or two.